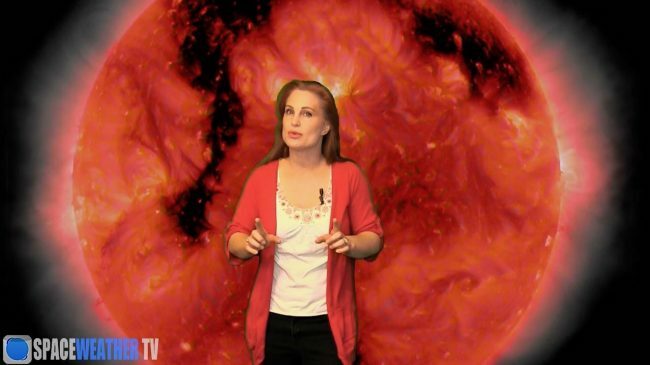 Regarding the last couple of posts recently about what affects Space Weather (and HF radio communications), this talk last week from Solar scientist Joan Burkepile of the High Altitude Observatory discusses what causes Radiation storms from Coronal Mass Ejections. She makes it interesting from a physics point of view. And as we understand the sun better, we also learn more about how the rest of the universe behaves. Click here to watch via YouTube. This entry was posted in News, Shortwave Radio, Space Weather, Videos and tagged CME, Coronal Mass Ejections, spaceweather, TomL on February 23, 2018 by Thomas. Almost 250 years ago, for over two weeks, the skies above parts of Asia lit up in what looked like a burst of fiery red. Those who saw the strange phenomenon kept notes of the event, and now it has been identified as potentially the longest geomagnetic storm ever recorded. A dim red sky reported to have been observed between the September 16 to 18, 1770 in East Asia was considered one of history’s greatest geomagnetic storms. But now, new materials have come to light suggesting the storm lasted much longer, for nine nights, and covered an area twice as large as originally thought. Continue reading at the Wired UK website. Thanks for the tip, Mark–fascinating! Of course, I’ve read in-depth information about the Carrington Event, but was completely unaware of the 1770 event. I’ve always said the biggest EMP threat will come from our local star. Frankly, it’s just a matter of time. I hope we’re ready! This entry was posted in Articles, Emergency Preparedness, News, Space Weather and tagged CME, electromagnetic pulse, EMP, Wired on November 16, 2017 by Thomas. (CNN) Mother Nature has had a hectic past couple of weeks of hurricanes, an earthquake, wildfires and flooding. But while our attention has been turned to these humanitarian crises, Earth ducked a cosmic bullet the likes of which could have crippled human technological civilization. Over the last week or so, the sun has experienced a series of solar flares, including the most energetic one in a decade. A solar flare occurs when magnetic energy in the vicinity of a sunspot is released, resulting in a bright spot on the sun that takes place over a time scale of perhaps 10 minutes — or even less. […]While solar flares can interfere with satellites, an even more dangerous phenomenon is called a coronal mass ejection (or CME). CMEs often accompany a flare and occur when some of the sun’s highly ionized material is ejected into space. Because a CME consists of matter and not the electromagnetic radiation of a flare, it can take a day or even more to travel from the sun to the Earth. Indeed, last week’s flares were accompanied by a CME, but it didn’t hit the Earth with its full fury. If a CME happens to be aimed directly at Earth, the ionized particles can slam into the magnetic field that surrounds the Earth and distort its shape, a process called a geomagnetic storm. That’s when things can get dangerous. Moving magnetic fields can induce electrical currents on the Earth’s surface and damage equipment. In 1989, a CME hit the Earth and knocked out power in Quebec and the northeast United States for nine hours. And in 1859, an enormous CME hit the Earth. Called the Carrington Event, after Richard Carrington, who observed and recorded it, this geomagnetic storm caused telegraph pylons and railroad rails to spark, shocked telegraph operators and was responsible for auroras visible at least as far south as Havana, Cuba, with some claims of auroras being observed near the Earth’s equator. […]A report by Lloyd’s of London in 2013 estimated that the damage to the US grid from a repeat of the Carrington Event would be in the range of $0.6-$2.3 trillion dollars and would require four to 10 years to repair. One additional note: I’m currently in the process of writing a lengthy article about how to protect your gear from an EMP (Electromagnetic Pulse) emanating from an event like this. In the past two weeks, I’ve had an uptick in inquiries about this, so I thought it best to consult an expert and produce a post. I’ll hopefully have this article published within a week or so. I’ll post it with the tag: EMP. This entry was posted in Ham Radio, News, Shortwave Radio, Space Weather and tagged CME, CNN, Coronal Mass Ejections, EMP, Michael Guerin, Mike (K8RAT), Solar Flare, Space Weather, Tamitha Skov on September 16, 2017 by Thomas.